Both Tuscany Village and Rhodes Ranch have homes available for immediate move in. Availability of Rhodes Homes include La Luna, Terrazzo, Melani, Zanetti, Avellino, Fiori, Montebello, La Piazza and Presaro with upgrades. A builder’s incentives are offered with the preferred lender. The townhomes for sale in Las Vegas, Nevada real estate are priced from the low $200,000s and range from 1.264 to 4,876 square feet. Several communities in Rhodes Ranch real estate include The Majors, The Irons, The Collection, Palm’s Bay, Pacific Mist and the Fairways. Prices start from the $200,000s. Both Tuscany and Rhodes Ranch surround championship golf courses designed by Ted Robinson Jr. with walking trails, parks and recreation centers. Tuscany Residential Village and Rhodes Ranch include R Club and La Vita Tuscana 35,000 square foot recreation centers. The multi million dollar recreational facilities include the Fun Zone water slides. Rhodes Homes has a long term commitment with support of the local community and donations to existing Southern Nevada charities created by their own Rhodes Homes Charitable Giving Committee. Call 702-505-6988 for VIP Lake Las Vegas Homes search by a Las Vegas real estate agent. 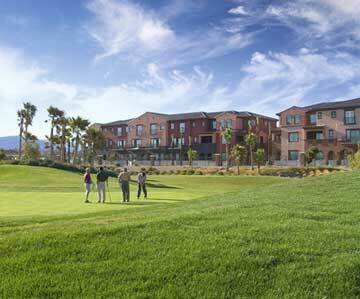 Pesaro new homes in Tuscany Village Las Vegas offer golf course views.